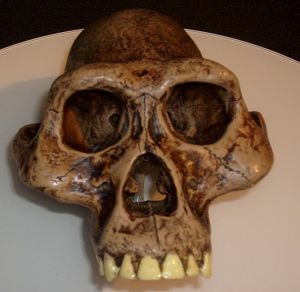 Australopithecus Afarensis: The Missing Link? The first Australopithecus Afarensis skeleton, 40% complete, was discovered by Donald Johanson in Hadar, Ethiopia in November, 1974. Though the species was not named until 1978, "Lucy's" discovery caused an immediate stir in the creation vs. evolution debate. The first A. afarensis skeleton was named Lucy, because the Beatles song, "Lucy in the Sky with Diamonds," had been playing repeatedly the night of the discovery. The second discovery of Australopithecus afarensis was of portions of 13 individuals in one area the following year. They were nicknamed "the first family." 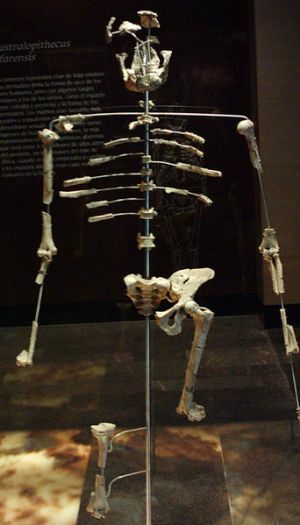 There are numerous indications that A. afarensis walked upright. The pelvis is much more human than ape-like, and the big toe faces forward. In modern apes, the foot looks much like a hand, and the big toe, which is really a thumb, points to the side enabling it to grasp branches. Austrolopithecus afarensis reconstruction. | Photo by Jim Linwood, used with permission. | Notice the long but forward-pointing big toe. A thumb, however, is not as helpful as a big toe in walking. When humans walk, we "toe off" with the big toe enabling our step to be longer and more powerful. The femur angles in towards the knee. This allows the foot to fall closer to the midline of the body, which is a strong indication of habitual walking on two feet. 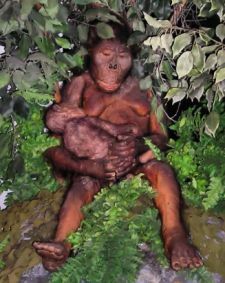 There are questions among scientists about whether afarensis spent a lot of time in trees. The curvature of the fingers, the anatomy of the wrists, and some of the anatomy of the shoulders indicate they would have been powerful climbers. This doesn't affect our discussion, though. The fact remains that A. afarensis lived in the right location and has the right brain size and features to represent an intermediate between the Homo genus and earlier australopithecines. The fact that they walked bipedally is much more important than whether they also spent a great deal of time in trees. This much of Lucy was found. Until A. afarensis was discovered, it was thought that brain size increased before bipedality occurred. The discovery of Lucy and the first family gave the lie to this. These early australopithecines had a brain only barely larger than a chimpanzee. In fact, the discovery of the afarensis species suggests the possibility that our ancestors went straight from living in trees to walking upright. It used to be thought that knuckle walking, as modern great apes do, evolved first and led to upright walking. The chances are, that's not true. Instead, knuckle walking developed later or separately. Another key issue with A. afarensis was the size of its teeth and the shape of its jaw. Its teeth are smaller than its ancestors and modern ape teeth, though not as small as human teeth. Its canine teeth are also intermediate between apes and man. Finally, its jaw is beginning to obtain the parabolic shape of human jaws rather than the rectangular ape jaw shape. Is Australopithecus Afarensis a Missing Link? Well, it can't be. It's not missing. However, since what we really wonder is whether a species is actually our direct ancestor, the answer is yes, Australopithecus afarensis is a missing link. We can never know that any species is really our direct ancestor. But as we observe the time, location, and development of species in the fossil record, we can easily determine—especially for humans—the general tack that evolution is taking. Australopithecus afarensis is on that line. We do have one more thing we have to cover on this missing link: Was "Lucy" a hoax foisted on us by Donald Johanson?